At 23:00 I left the house for Schiphol airport. Because of some construction activities on the railway on Sunday there was to little time to get on time at the airport, so I had to leave with the last train and spend my time at Schiphol. At 7:00 a.m. it was possible to check in, and at 10:00 in the morning I took the flight to Zurich. At 11:50 I arrived at Klooten, the Swiss airport. My connecting flight to Belgrade did go at 12:50 and at 14:00 I arrived at Belgrade airport. It was sunny and nice weather overthere, and the flights were relaxing, because they were cut in half, giving some time for a smoke. And each flight was less then 1.5 hours, which is better than sitting in a plane for 12 hours like the last visit in Seoul. Jitze came to pick me up at the airport and we drove to a shooting that was going on and he was participating at earlier on the day. On the shooting alley the compitition was still going on, the next day I would have my first shot, read more about that on day two. After the competition we drove back to the house, where I saw Christien and the kids, and after showing the house we started to do some camp fire activities in the garden, that is big and has lots of trees. The fire would burn for more than two days and went out because of the rain and lack of new wood. Of cause we sat down at the fire drinking a cool Serbian beer called Jelen Pivo. It's a good beer. In the evening we spend some time on the new look of the Zofona website, the website gets a new look in a couple of weeks, keep visiting this site and you will notice. Up at 10:30. I had a good sleep, also because I didn't sleep the night before, because I had to go earlier to Schiphol. We drove to the inner city of Belgrade. While driving to the city you can see some big buildings (I guess former governmental buildings) that were damaged by NATO bombardments in 1999. The city looks better than I expected, Belgrade has a lot of big and old buildings, and lots of them have quite the same building style as Vienna (never been there, but have seen pictures). The shopping streets are wide, and it was quite busy with people shopping and wandering around for a monday afternoon. After walking the shopping street you get to the Kalemegdan area. Kalemegdan houses a park and the fortress overlooking the Sava and the Danube rivers. The name of the city "Belgrade" (or Beograd in Serbian), is named after the fortress. 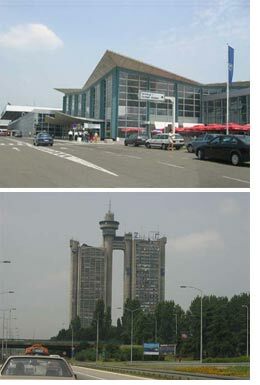 Beograd means means a "white town" or a "white fortress". You can walk in this vast parked area, and it was very busy with people, also because the weather was great for november: 19 degrees celsius and a lot of sun. At the end of the area at the end you have a great view of the Danube river and a part of the city called Zemun and Novi Beograd. Later on we drove to the shooting alley as we did the day before, I would have my first shooting lesson. After instructions how to hold the gun, I could have a shot a the paper targets with circles on it. The inner circles were black and the papers could be moved to 10, 15 and 20 meters. I managed to hit the black circled area on 10 meters 10 times out of 14. Which was a good score I think. I was satisfied with my results. Later Jitze shot at the 15 and 20 meters distance, all in the black circled area, and I had one shot on 15 meters. Not a busy day, I drove with Christien to the Metro, a big supermarket on the edge of town. In the evening Jitze and I went to this Italian restaurant called "Trattoria all Angelo", Jitze went already to this restaurant and gave a restarant review on it. The review was good, and this time to food was good too: take Salmon as a starter, it's a good salmon, with some lettuce and dressing, and they put some lemon in it. It's tasty. The pizza was also good, I had the "Quatro Stazione", a big pizza, with a lot of things put on it, as a pizza should be. The price was also good, as I remember correctly 2600 Dinar for 2 persons, including drinks. After the italien restaurant we went to "Sillicon Alley", it's called that way because according to the Lonely Planet this street would be filled with "sillicon enhanced" girls wandering around. Well, that might be in summer, or it was still too early in the evening, or maybe because it was a Tuesday: no sillicon girls, in fact, hardly any girl in this street. The street has bars, but they weren't busy at that time. We went to the Scottish pub and had a couple of Tuborg draught beers. I'm not a fan of Tuborg, pity they didn't have this Jelen Pivo beer. After the bar we went to the cinema "TuckWood" to see the new Borat movie, it's a funny movie, but I guess I've seen too much Borat to find the movie extremely funny. People said "TuckWood" is the best cinema in town. It was busy, all chairs were sold. Sound and chairs were OK, maybe just a little bit too small sitting space. Going to a movie isn't expensieve if you are used to the Dutch cinema prices, in Holland it is around 9 Euro, in Belgrade it is 250 Dinar, that's around 3 Euro. Today we went to Novi Sad, about 80km up to the north of Belgrade. The city has about 350,000 inhabitants and is the second city in Serbia. The road Belgrade - Novi Sad is good, and you have to pay toll, Novi Sad is good, and you have to pay toll. Novi Sad is a nice city to see, a lot of old buildings and churches. 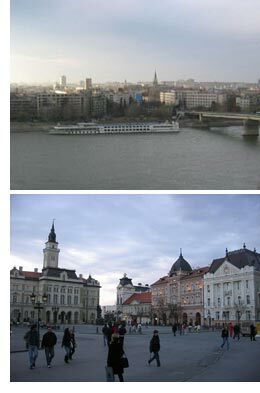 Like Belgrade the city is also located at the Danube river. We visited the fortress, that is build at the Danube on a hill. The structure and walls are massive and impressive. Pity though there was a lot of litter, lots of broken whine/beer bottles and other trash. I think Novi Sad is a nice city to visit in the summer time, when terrasses are all over town. The city centre has broad streets, and if you like shopping, there are lots of stores. The city isn't as crowded as Belgrade, what makes it a more relaxing city to visit. 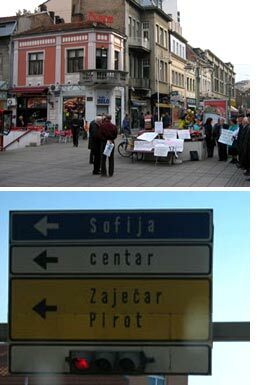 If you go to Belgrade, if you ahve the time, definately take a visit to Novi Sad. In Summer there is the Exit summer festival, four days of camping and concerts. On day five we went to Nis, a city in the south of Serbia, about 200 km. from Belgrade. Nis looks poorer as Belgrade or Novi Sad and as far as I could have seen these wasn't much interesting going on. If you like castles, you can visit the fortress, just like Kalemegdan in Belgrade there is a park, but besides that there isn't much to see. It is in Nis that the roads go into two major directions: South, leading to Thessalonica and Athens, and East, leading to Sofia and Istanbul. In the afternoon we departed from Nis to the East to the Bulgarian border. Because of a "By pass" we had to drive through the mountains, this road took a lot longer, and there wasn't much to see because around 16:00 it started to get dark. We arrived at the Bulgarian border when it was dark. After several checkpoints we drove on the Bulgarian roads, they were very bad compared to the Serbian roads, a lot of bumps and holes. As you might know Bulgaria joins the EU in 2007 , so one of the things they have to do in the years to come is to improve the roads. We entered a rainy Sofia in the evening around 20:00 and we found a hotel close to the city centre. We had some food at a local "Golden Chicken" restaurant, later on the evening we visited the casino and had a few drinks at a nightclub. We had a walk in Sofia by day, and like yesterday it is raining again. By daylight you can see that a lot of buildings need renovation and some new painting done. Not all buildings, but a lot. In the inner city there are also big buildings that look great, but overall seen the buildings and roads are better in Belgrade. Because it was raining Jitze went back to get the car, but couldn't move it because it was clammed. For your information, the costs to remove a wheel clamp in Sofia are around 10 Lv., about 5 Euro. At the time we left Sofia for the trip back to Belgrade, it was still raining, but after the mountains in Serbia the sun was shing again. After getting home we drank some home brewn Slibowitz, a brandy made from plums and the national alcoholic drink. In the afternoon we "cruised around" in Novi Beograd (New Belgrade) and Zemun, located on the other side of the Sava river. Novi Beograd mostly consists of high office and apartment buildings. At Zemun we went to a shooting alley where we did have some other shots. In the evening Jitze, Christien and myself went to have dinner on a restaurant boat in the Sava river called "Dialogo". From the boat we had a great view of Kalemegdan and the fortress at night. I ordered a steak and some salad. The stake was big, at least twice as big than the average steak you get served in a Dutch restaurant. And it was a tasty steak too. After the restaurant we went to Sillicon Alley to have a couple of drinks. Later on the evening we had a drink at another bar and another home brewn Slibowitz. I woke up pretty late. Today is the day that I will fly back to Amsterdam. We went to the airport and after checking in we had a smoke outside. Still sunny and a great temperature. At 14:40 I flew with Swiss Air to Zuerich, at 16:25 I arrived and at 17:30 I departed from Zuerich to Amsterdam where I arrived at 19:10. 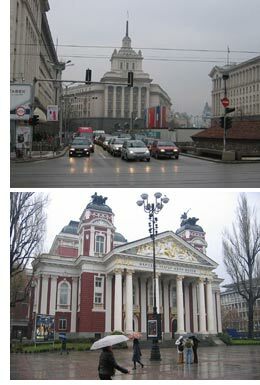 I had a great week, Belgrade is a nice city, actually it looked much better than I expected. 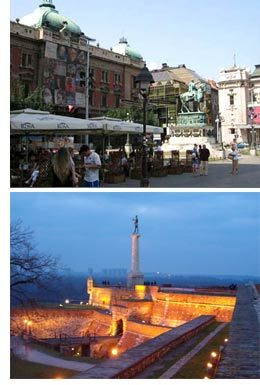 Belgrade is one of Europe's oldest cities and there is much to see. A small part I have seen, leaving enough for the next time. As always everything was perfectly arranged at the Zofona house, thanks for the hospitallity Jitze and Christien, another ****** (6 star) hospitallity award!